Respect. Honesty. Courage. These three distinct words have significant meaning at Stephen Gaynor School as the cornerstone of our Faculty Diversity & Inclusion Committee (FDIC), a wide-ranging initiative intended to foster an inclusive environment that supports and celebrates each individual in our school community. Celebrating diversity in learning styles has been a core value at Gaynor for more than 50 years. It is important that we continue to recognize and welcome all forms of diversity: race, religion, ethnicity, socio-economic, gender, sexual orientation, family structure, learning and physical abilities, or age. Led by the Director of Student Life/Diversity Coordinator, the Faculty Diversity & Inclusion Committee works to raise awareness, promote critical thinking, and encourage responsible action around issues of diversity. Through these efforts, we can ensure that these values are infused in all aspects of the school for students of all ages. Gaynor teachers are committed to incorporating the FDIC values into ongoing lesson plans, social development curriculum, and events. This may look different throughout the school, depending on the age group, but the goal is united. Early Childhood teachers read the book, The Skin You Live In, by Michel Tyler, to help students better understand the varying skin tones people have all over the world. Students find their own skin tone by mixing together a combination of eight shades of paint, realizing their skin is not one color, but a mix of many. Lower School students may harness the spirit of Thanksgiving to illustrate the importance of respecting cultures and religions that are different from those of each student. Middle School students may participate in activities like taking a vow of silence for the Gay, Lesbian, and Straight Education Network (GLSEN) Day of Silence. Participating students vow not to speak the entire school day and wear blue t-shirts and rainbow ribbons to signify their participation. Faculty members also don rainbow ribbons to demonstrate their support, providing a powerful visual symbol of solidarity in every corner of the school. 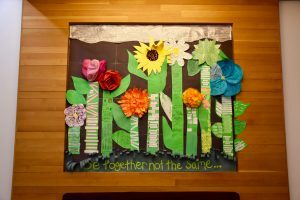 Through these simple examples, it’s easy to get a glimpse into how community values and a sense of inclusiveness are woven throughout the curriculum at the school. At Gaynor, we celebrate each individual in our school community and hope that they feel the positive impacts of this initiative every day. The Parents’ Association Diversity & Inclusion Committee is dedicated to promoting and advocating for increased diversity among our Gaynor families.